Draped in a mink coat, a woman dropped her 5-year-old son off at Jill Hinckley’s pottery studio. When she came back to collect him, he was covered in mud. What his mother hated, Jill loves. Jill’s been getting ‘glurpy’ for over 50 years. In the 1960s, she owned an art gallery in New York that sold contemporary drawings. Moving to Georgetown for a change of scenery, Jill planned to open a similar gallery, but soon learned that most of the artists she wanted were already showing in other galleries. She began opening her eyes to other art forms—primarily photography and pottery. 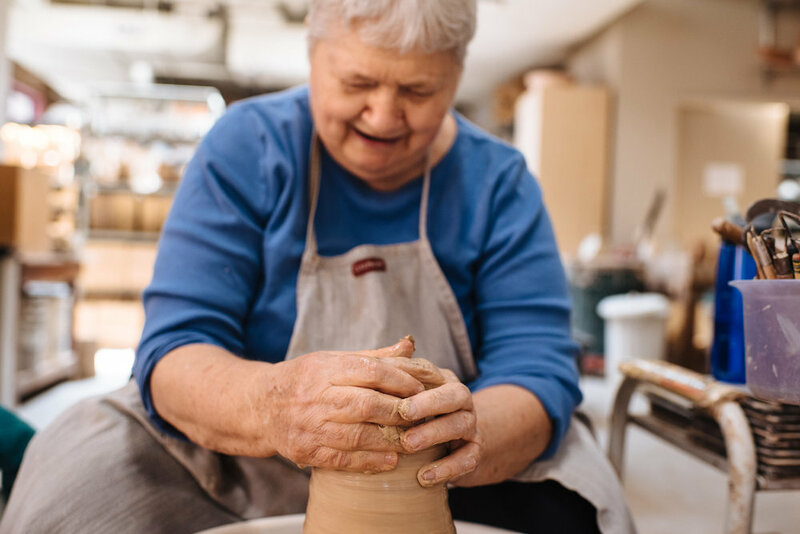 After taking in a few potters and photographers at her new studio, Jill discovered Teruo Hara, a celebrated Japanese potter who taught at the Corcoran. She became acquainted with many of his students, who were talented and understood the Asian pottery techniques that Jill would later love herself. With an art gallery on the second floor of a Wisconsin Avenue building and a pottery studio in the back, Teruo’s students began to teach. Jill became their apprentice. A year later, in 1968, Jill began teaching pottery for children and beginners. She says she wasn’t very good, but the studio needed help. Eventually, Jill was teaching everyone. While Jill’s burgeoning career remained steadfast, her studio space saw many changes, moving out of Georgetown and into Foggy Bottom. When that building was torn down to make way for a high-rise, Jill again relocated—this time above an Ethiopian restaurant in Adams Morgan. Think about what it’s like to pack and unpack one kitchen’s worth of plates and cups and bowls, and then think about doing the same for an entire pottery studio. But Jill and her team settled into a new Adams Morgan location in Kalorama—a very funky, ‘iffy’ neighborhood at the time—and stayed for over two decades. When the landlord needed the space to expand another business, out—yet again—came the boxes and bubble wrap. Hinckley Pottery looked, and looked, and looked, finally finding a space in Georgetown’s Blues Alley. No electricity, no heat, no water, no gas, no nothing. Over a year, in fact. From an abundance of sprinkler system regulations to delayed electrical work, Jill says the process was overwhelming. Hinckley Pottery's students—once numbering over 175 before this year’s setback—are anywhere from 9 to 83 years old. A few have been with Jill since the late 60s, often become ‘lifers’ after their first 10-week class. To the outsider, throwing pottery often looks easy. It is easy for Jill. She’s been practicing for 50 years, after all. 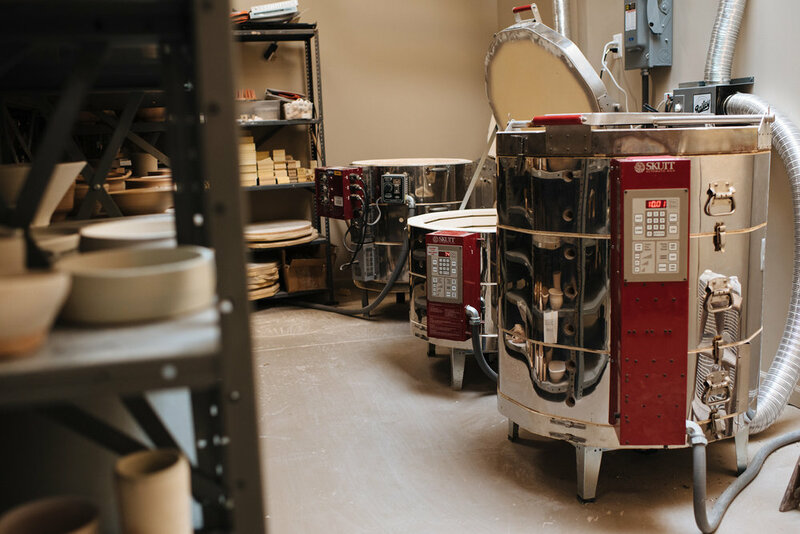 For those whose pottery expertise begins and ends at the scene from Ghost, Hinckley offers a 2.5-hour ‘try it’ class behind the wheel. 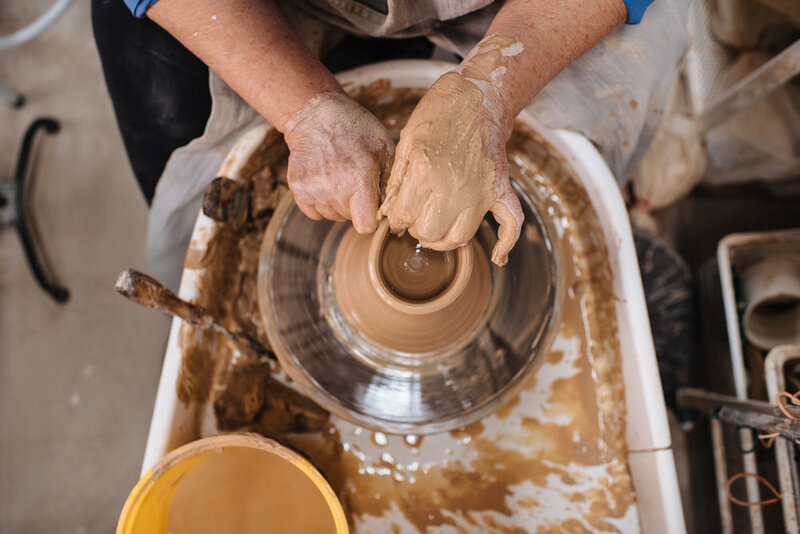 Jill says the same type of person who enjoys yoga and other forms of relaxation is often drawn to art form—a way of taking your mind off of everything else and concentrating on the act of throwing a pot. Most of Jill’s students start throwing by the end of their first lesson, eventually learning how to trim, glaze and fire their pots. For Jill’s part, all of the pots on sale at Hinckley are hers. She says she’s always making something new, selling it, and trying to get new restaurants and shops interested in taking on her pots. At 80, Jill’s interests are as steady as her hands behind the wheel. When she’s not at the studio, she’s tending to her Takoma Park garden. Jill leans back in her cushioned chair, those same hands covered in mud, sheepish grin spreading across her face.